Lots of jokes from the Mock The Week regular with his brand-new show. Gary's previous tour extended four times, playing over 240 dates. Now he's back with a brand new show entertaining the UK with his famous one-liners and expertly crafted comedy. Widely regarded as being one of the most quotable one-liner comics in the country, with a huge twitter following. His talents have led him to write for 8 Out Of 10 Cats, A League Of Their Own, Live At The Apollo and The Royal Variety Performance. 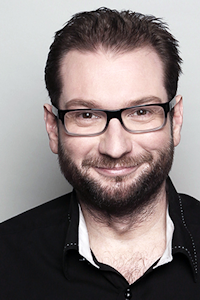 Gary Delaney thinks that most shows don't contain enough jokes. He is trying single handedly to redress the balance. Expect: Jokes. Don't Expect: Narrative, themes or a voyage of self-discovery. Gary has appeared on BBC1's Mock the Week, BBC3's Edinburgh Comedy Fest Live and BBC Radio 5 Live's 7 Day Saturday. He is also a double Sony Award winner and Chortle Award nominee. Not suitable for bairns or sensitive souls. Gary's just turned 40 but he's not bothered. His dad is in fine health and, at the time of writing, his relationship is going well. So instead he's written some new jokes.